Intel managed to convince the market that the future of the PC world lay with the newly released LX AGPSet mainly because no other chipset manufacturer could boast the ability to combine the performance of a dedicated AGP bus along with SDRAM support, and support for the Ultra ATA specification...until now. VIA Technologies, the pioneers of chipsets that provide the greatest threat to Intel's throne, announced the VP3 AGP Chipset as a competitor to Intel's LX AGPSet months before its release, however the catch was that the VP3 AGP Chipset would be an AGP capable chipset for Socket-7 CPUs! Intel virtually abandoned the Socket-7 market when they migrated to the proprietary Slot-1 design of the Pentium II, however companies like AMD and VIA in correspondence with each other managed to breathe more life into the seemingly dead standard. 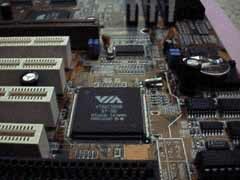 Imagine for a minute in your mind, the idea of a perfect Socket-7 motherboard. What form factor would it be based upon? How many SIMM/DIMM slots would it have? How much RAM would it be able to cache? Next, take a look at the FIC PA-2012...notice any similarities? FIC's goal with their earlier motherboards was simply releasing a high quality motherboard that could knock the socks off of anyone that used it. However with the PA-2012 the goal was perfection, plain and simple. Starting with the excellent layout of the 2012 courtesy of the ATX form factor it is based upon, the PA-2012 provides 4 PCI & 2 ISA slots and of course, that one precious AGP slot. Unlike some other newer ATX motherboards, the PA-2012 fully meets the ATX specification by placing the Socket-7 IC in the path of the air flow from the ATX Power Supply in your case and by placing the HDD/FDD connectors at the corner of the motherboard convenient to the drive bays in most ATX cases. Don't plan to recycle your old SIMMs with the PA-2012, FIC took the route most manufacturers have been taking with the PA-2012 by including a total of 3 DIMM slots capable of accepting EDO or SDRAM DIMMs in 8MB, 16MB, 32MB, 64MB, 128MB, or 256MB modules for a total of 768MB of RAM. Now that 768MB memory limit wouldn't be much of anything if you could only cache 64MB of it, however with the 1MB of onboard L2 cache on the PA-2012 along with the sheer power of the VIA VP3 chipset you can realistically use all 768MB of RAM without the worry of a uncached performance hit. This is a result of the massive 1GB Cacheable Memory Area of the VIA VP3 chipset, a feature of the VP3 chipset that can even outshine the more expensive "high-end" Pentium II systems which are limited to a cacheable memory area of only 512MB. Along with the immense cacheable memory area the VP3 chipset provides, it also gives the PA-2012 the power to support Ultra DMA/33 hard drives as well as lightning fast SDRAM, not to mention the support for future DDR-SDRAM. As mentioned earlier, one of the key features of FIC's PA-2012 is the onboard Accelerated Graphics Port (AGP) whose dedicated bus allows for incredible 3D graphics performance to be brought down to desktop PC levels. Taking advantage of the AGP port on the PA-2012 in addition to all VP3 based motherboards, is a little more tricky than with LX motherboards. 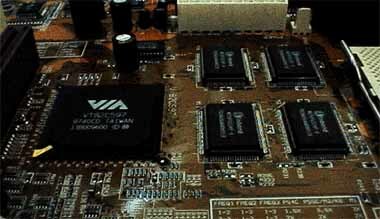 Not only do you need to use your video card manufacturer's AGP drivers, but you also need to have VIA's own VxD installed in order to take full advantage of the AGP specification. Luckily, FIC included an extremely useful CD with the PA-2012 containing not only the hard to find VIA Bus Mastering Drivers but VIA's AGP VxD files as well as a few other handy utilities. 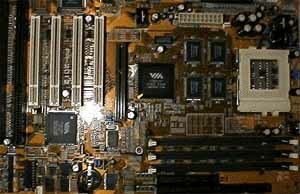 While the PA-2012 is an excellent motherboard, its quality extends much further than the ease of its setup and initial installation. Boasting PC '97 compliance, the PA-2012's bundled CDROM includes a Desktop Management Interface utility identical to those found in many of ASUS' and AOpen's offerings. Along with that the 2012 sports its own set of patent-pending Intelligent System Management & Protection features (ISMPTM) which include a CPU Thermal Monitoring Alert a feature common to many Shuttle Motherboards, a Chassis Intrusion Alarm which alerts a system administrator if the case chassis is opened, as well as System Over-Voltage Protection & Report, a feature that automatically shuts the system down if the I/O or CPU Core voltage increases by a factor greater than 5%.